What’s the secret to recruiting top talent? Your employees. Employee referrals are a great source for qualified, all-star talent. Aside from being more familiar with your brand, culture, and company mission, referred employees have shorter, less expensive hiring timelines and better retention rates than those sourced from other channels. 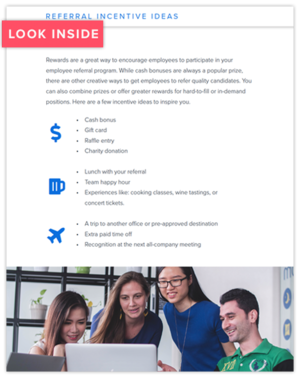 Having the right employee referral program can encourage your employees to share your company’s open positions with their networks and recruit interested candidates. You can quickly fill open roles while your employees get a say in who they work with and help shape your company’s future. Talk about a win-win! From an employee referral policy template to incentive ideas, this eBook will give you everything you need to launch your own employee referral program or to give your current policy a refresh.